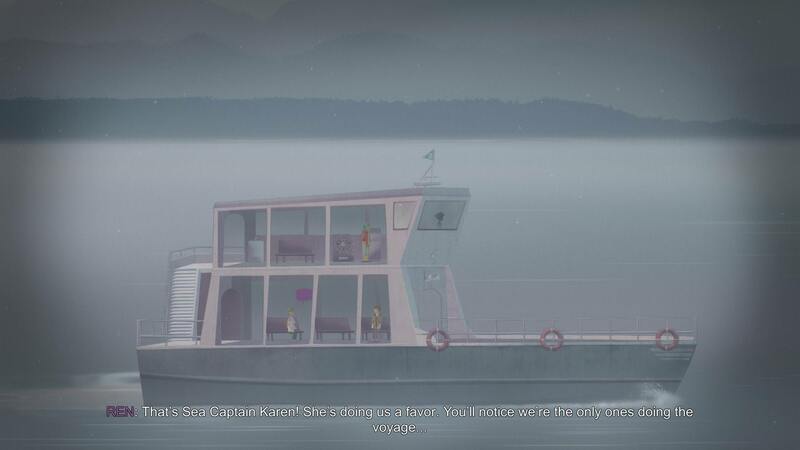 In the first scene of Oxenfree, a group of teenagers travels on a ferry steered by a shadowy figure named Karen, an allusion to the mythical Greek figure Charon, who ferried the souls of the newly deceased to the land of the dead. Weird, isn’t it? A mere recreational trip is framed as a journey of the deceased through thick fog to some isolated netherworld. Alex, the controllable character, is asked by her friend Ren to tune in to their high school station with her portable radio, which later will allow her to literally contact the dead. On the first playthrough, the characters will simply hear a reference to their ongoing trip to the fictional Edwards Island for a “yearly bash on the beach.” On a subsequent playthrough—when the player already knows that this bash will feature ghosts, trans-dimensional rifts, and temporal anomalies—Alex hears a new message from herself, as if broadcast from another time and another world, probably the world of the dead. Even before reaching for the radio in the New Game Plus, she gets an impression that all this has already happened. History, the only means of communication the dead have at their disposal, is paradoxically also what makes communication impossible. 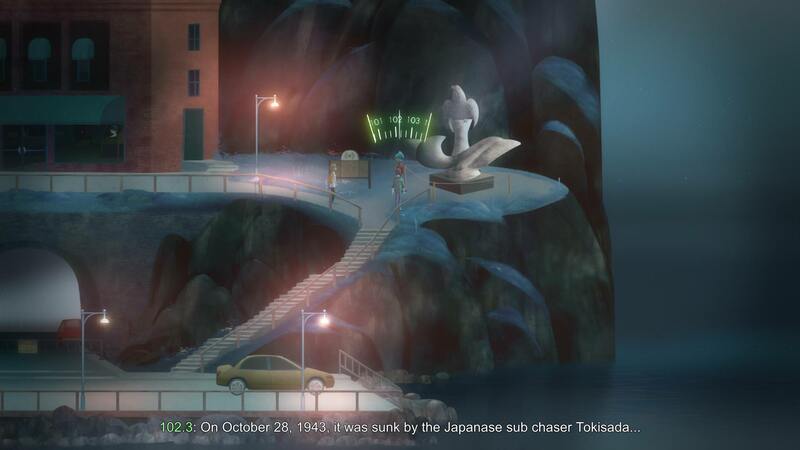 One of the first landmarks the player finds on the island is a monument devoted, according to a nearby information board, to the victims of the only submarine casualty in American waters during World War II. Importantly, this monument stands on the propeller from the sunk boat. Later in the game, it turns out that the actual cause of destruction was a nuclear missile launched by a friendly unit, and not by the Japanese as the official account would have it. Thus, the memorial silences the dead by embodying the official, untrue version of events, and on the other hand, it is haunted by their real presence in the form of nuclear radiation that still clings to the propeller. But this presence is unexpressed, dispersed. Radiation, just like water, is a medium which symbolizes the deprivation of the dead’s corporeal integrity, and thus, of their identities. History, even when true, is always helpless against the actual experience of death. This monument thus sets up the main tension of the game between the impossibility to convey the terminal experience of dying—symbolized by such images of dispersion and indefiniteness as water, fog, radiation, and even audiovisual glitches and distortions, which represent gaps in the flow of information—and the attempt to do so in the fallible media available for describing or recording reality. Language is the most important, and the most fallible, of these media. When Alex finally confronts the ghostly victims of the submarine disaster, they express their inability to remember “certain things” like their faces and names. The word “things” epitomizes the process of forgetting. When the dead lose contact with the reality of the living and forget words used to describe this reality, they are thus deprived of any possibility of expressing themselves. The forgetting of language is associated with the loss of identity. Interestingly, this is mirrored by the core mechanic of the game: chatter. Most of the time, while exploring the island, the characters are engaged in a constant flux of conversation. However, since they are teenagers, their vocabulary is strained when faced with events exceeding their comprehension. Thus, conversations are full of meaningless words that either fill the conversation or substitute for an unknown name with placeholder terms; these words include “things,” “stuff,” “dunno,” “um,” “whatever,” or “like,” describing by approximation. Just like the dead who forget their language, the living are struggling to name their situation, and this struggle is bound to fail. Oxenfree paradoxically concentrates on conversation in order to suggest the inability of everyday speech to express and communicate. In this way, the game equates the inattentive language of the living with the language of the dead. At the core of the game is some empty space, a blind spot, which neither conversation nor the official discourse can reach. This blind spot is thematized as death and mourning, but not a specific death or a specific process of mourning. Edwards Island seems to be a liminal place, a limbo, where all the dead form one fluid, indistinct mass. This coalescence could be treated in this game as the vague and diffused referent of the word “whatever” that characters use to ensure the flow of conversation when they can’t—or don’t want to—name something precisely. And the living, after reaching this space, seem to undergo the same process of identity loss. The victims of the submarine bombing are linked with Michael’s death through the motif of drowning. When Alex tunes in to the world of these victims using her radio, she also starts reliving past events focused on her late sibling. Jonas, Alex’s step-brother, occasionally mentions events from Michael’s past, of which he is ignorant; Alex sees Ren, her friend, drowning in a vision; and Clarissa, Michael’s girlfriend, draws special attention from the ghosts who share a similar grief and anger. It is as if the living and the dead are interchangeable. They become “things” not in the sense of objects, but in the sense of placeholder names without any clear reference, permeated only by some vague and general sense, here thematized as supernatural possession by ghosts without identity. “Things” can mean “whatever” on Edwards Island. Oxenfree goes a step further to include the player in this liminal, fluid space of death, where everyone is deprived of their identity and thus interchangeable with everyone else. At some points in the game, Alex confronts her reflection in the water, or in a mirror. This reflection is tagged with another player’s username, and the player gets to pick the dialogue option uttered by this mirrored doppelganger from the other side. 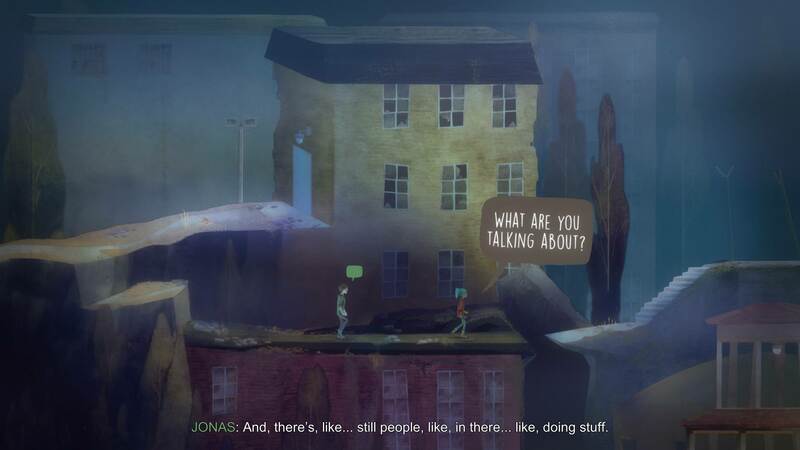 The dialogue refers to a choice the player will have to make later on; however, the choice itself will refer to the past before the events of the game (Michael’s decision to go to school and Jonas’s contact with his dead mother). What’s more, by the end of the game, we become the reflection marked with our own username and get to advise another Alex, who could be interpreted as belonging to another player’s playthrough. Players are then equated with the dead possessing the characters. And just like these ghosts, they are made to feel as interchangeable “things,” whose only sign of identity is their username. The same applies to the idea of choice. Our virtual selves, all the options we could have chosen but didn’t, come to haunt us as our avatars possessed by another player. Like a mourner mulling over what could have happened and how some fatal incident could have been avoided, the player is confronted with a virtual self they could have been had they chosen a different path. And, ironically, these choices refer to the past, and so they cannot change anything. They are empty, interchangeable. They do not matter because of the inexpressible event, death, emptying the experience of time of its content, and haunting each moment with its nullifying and inexpressible presence. The poetics of Oxenfree is a poetics of the inexpressible, which can be illustrated as water filling up the lungs. Death is the event—either experienced directly, as in the case of the submarine attack victims, or indirectly, as in the case of Alex and other characters—that precludes any possibility of communication. Edwards Island, this world of the dead, is a fluid space, where people lose their identity, words lose their reference, actions lose their consequences, and the actual has the same value as the virtual. Even if the characters leave the island and reach adulthood, their lives will still be defined by this void, this one event, to which they will have to return in a temporal loop. That is why the game undermines the temporality of a coming-of-age story, oriented towards future, with the fluid and undefined temporality of death, which empties the notion of the future of its sense. Bartłomiej Musajew is a PhD student interested in literature and videogames. He lives in Warsaw, Poland.